Soundwave is unique among his Decepticon brethren in that he not only has an alternate form, but he also has several companions at his disposal. He may transform into a digital radio recorder/receiver and has employed up to six smaller character-scaled Transformers as a means of both espionage and defense: Ravage, Laserbeak, Buzzsaw, Ratbat, Rumble, and Frenzy. While Rumble and Frenzy are similar in appearance and talents, as well as Laserbeak and Buzzsaw, Ratbat and Ravage stand out as not having a “ twin” among the Decepticon spy cassettes. 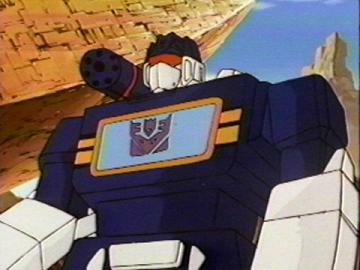 In his alternate form, Soundwave is able to directly interface with all computer and security interfaces, gaining +1D+2 to all applicable Tech rolls.